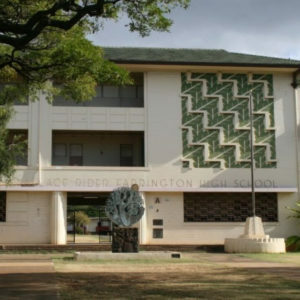 We are very excited to be working with the sophomore students of the Farrington High School Engineering Academy to select, design, and install a Complete Streets Quick Build project on North King Street, using the principles of tactical urbanism under the guidance of Street Plans Collaborative. The students—the majority of whom walk to school—are faced with a myriad of everyday challenges in getting around the district, and this project is intended to increase safety, celebrate school and neighborhood pride, and engage the community in practical solutions. Stay tuned for updates and other Quick Build projects around Oahu.